Mizoram has once again started raising demands for expulsion of minority Chakma and Bru tribals from the State. A large number of social organizations including the state’s NGO co-ordination committee including student bodies have submitted a memorandum to the minister for administrative affairs K Lalrinliana demanding steps to oust Chakma and Reang tribesmen from the state, according to reports. Sources in Mizoram said that soon after the formation of the Mizo National Front (MNF) government last year the incidents of victimization and repression on non-Mizo people have increased considerably. However, the president of the Young Mizo Association (YMA) Vanlal Roata has denied reports of repression on non-Mizo people. 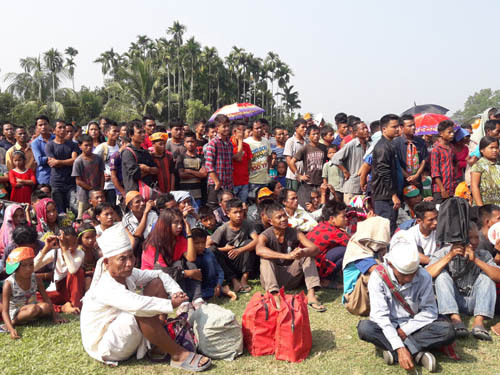 Meanwhile, a number of Mizo social organizations including the Mizo Zirlai Pawl have demanded immediate dissolution of all non-Mizo dominated villages in the state and expulsion of the residents, describing the settlements as well as their residents as ‘illegal’, reports added. According to allegations made by Ramdin Liana Rentholei , president of MZP, there are 21 villages in the state in which the Bru and Chakma people have been living illegally. Out of the 21 villages identified by MZP, 19 are located in Lunglei district while two are in Mammith district of the state. The YMA, MZP and other social organizations allege that the Reangs and Chakmas have entered the state from Chittagong hill-tracts of Bangladesh illegally and have been living in the state.